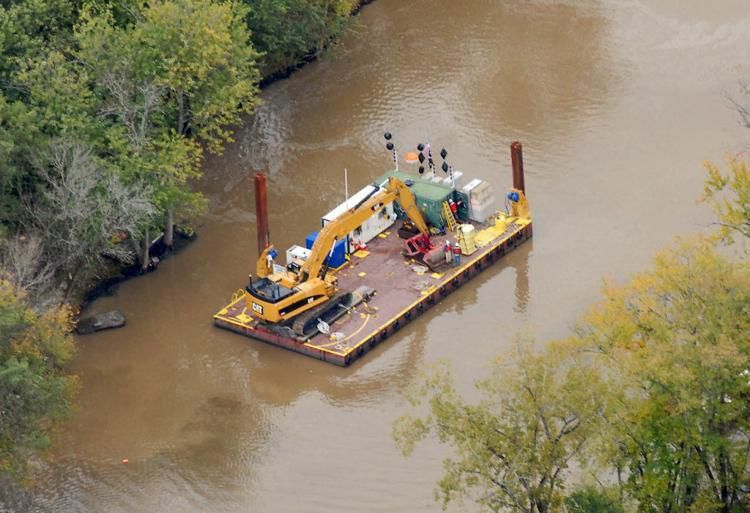 A dredging barge moves up the Hudson River in Fort Edward in October 2009 during the project to clean up PCBs in the river. A state official says the federal government is poised to determine that GE met its goal of cleaning the river despite ongoing opposition. Washington County sheriff's Officer Ethan Macura with the agency's new police dog, Belle. The canine is named for the late Cambridge-Greenwich Police Chief George Bell. Researchers from Paul Smith's College sweep the forest floor, collecting ticks on a white cloth. New York’s top environmental official said the federal government is poised to determine that General Electric met its goal of cleaning the Hudson River, despite opposition from environmentalists and state officials. Environmental Conservation Commissioner Basil Seggos has said his office has been in contact with the Environmental Protection Agency over a potential finding that GE’s $1.7 billion cleanup of the river satisfies a 2002 agreement between EPA and the Boston-based company. The “certificate of completion” could absolve GE of further liability for polychlorinated biphenyls remaining in the river. Seggos, his boss Gov. Andrew Cuomo and a number of environmental groups believe that PCB levels remain too high in the river despite the multi-year cleanup. They want the EPA to require GE to resume work on the river. A state report released in December on the latest sampling data said PCB levels remain too high in fish and river sediments. “This should be a significant barrier to EPA issuing this finding to GE,” Seggos told the newspaper. GE completed removal of 2.75 million cubic yards of PCB-contaminated river sediment north of Albany in 2015. The reauthorization of the Violence Against Women Act passed the House of Representatives 263-158-1. U.S. Rep. Elise Stefanik voted against legislation to close the so-called “boyfriend loophole,” which would make it easier to take away guns from a person convicted of abusing, assaulting or stalking a dating partner. Stefanik had sponsored alternative legislation to extend the current law, which was passed in 2013. Stefanik spoke on the floor of the House of Representatives to express support for her bill, citing statistics that one in three women have experienced some form of physical violence by an intimate partner, 1 in 7 have been injured by an intimate partner, 1 in 10 have been raped and 1 in 7 have been stalked. “Let those numbers sink in for a moment. These are more than just numbers. They are our mothers, sisters, daughters, friends and colleagues in this chamber,” she said. Stefanik criticized House Speaker Nancy Pelosi for politicizing the issue and putting women and girls at risk. She said a “yes” on the bill before the House on Thursday would be a mistake. “You’re voting to end the Violence Against Women Act and knowingly voting for a partisan bill that will never see the light of day in the Senate. It will collect dust in the Senate,” she said. The National Rifle Association came out and said it would score the bill, which means that a vote in opposition would lower the rating for a lawmaker who supports it. Stefanik has received “A” ratings from the NRA. FORT EDWARD — A few years into his four-decade law enforcement career, the late Cambridge-Greenwich Police Chief George Bell was one of the first police dog handlers for the Washington County Sheriff’s Office. Bell died from a heart attack on March 11, 2018, a death of a well-liked career police officer that deeply saddened many in law enforcement and around the region. 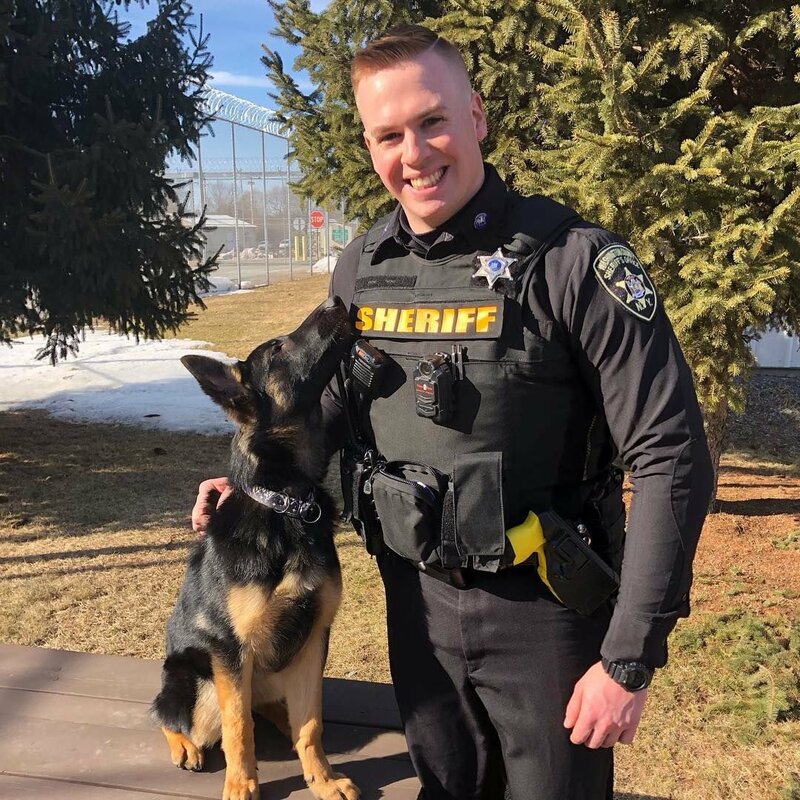 So when the Sheriff’s Office had the opportunity to add a new police dog in recent months, Sheriff Jeff Murphy said he and his staff decided that it was Bell whom the dog’s name should honor. Police agencies typically name dogs after local heroes or fallen law enforcement officers, and Bell’s place in Washington County law enforcement was well-chronicled. The new female German shepherd was given the name Belle in honor of the late chief and was sworn into service during an emotional ceremony on Friday. Cambridge Mayor Carman Bogle and the Cambridge-Greenwich officer appointed to succeed Bell in overseeing the department, Sgt. Robert Danko, were among those who got to take part in the event and meet Belle. “This is a wonderful tribute to Chief,” Bogle said. The $1 million the state Senate had put back into the budget for studying Lyme disease and other tick-borne illnesses is no longer there. The news was disappointing for local researchers, who used the funding last year to conduct an unprecedented study of ticks in the Adirondacks and to work toward a better Lyme disease test. Last year Ahern, a microbiology professor at SUNY Adirondack, had about $100,000 of that $1 million for the nonprofit organization Focus on Lyme. The money had helped with a biorepository, where testing of blood samples for Lyme and other tick-borne illnesses is done. The work will carry on, Ahern said, but perhaps a little bit slower. She didn’t count on the funds since it’s approved year-to-year, but she was surprised it wasn’t included. She was concerned about what would happen to fieldwork that Paul Smith’s College conducted last year. Professor Lee Ann Sporn and her students conducted the first study of its kind, collecting and testing harvested deer blood samples at state wildlife management areas in the Adirondacks, including in Warren, Washington and Essex counties. Students also wore white body suits and collected ticks on drop cloths. With the help of $30,000 from the state last year, Sporn and her students found that the lethal Powassan virus, which ticks can carry, was more widespread than previously thought. Working with the state Department of Health to test the deer blood, they found about 40 percent of deer collected throughout the Adirondacks had been bitten by a tick carrying Powassan. Three people had the virus in 2017 in Saratoga County. One man died from it. A quarter-million dollars in funding was allocated in the 2019-20 state budget’s Environmental Protection Fund to help increase diversity in the Adirondacks. On Monday, $250,000 of the Department of Environmental Conservation’s $300 million fund was set aside for the Adirondack Diversity Initiative, a volunteer-run coalition that has been around since 2015. The coalition’s goal is to make the Adirondacks more comfortable for people of different ethnicities, cultures and backgrounds to visit and live. The funding will go to the Adirondack North Country Association, which will hire a coordinator to expand outreach and programming. Organizers said they will seek an applicant in the next few months, after they receive the money and develop a plan. “We should be able to start investing in this program effort almost immediately,” Adirondack Council Executive Director William Janeway said. The council is one of the groups behind the Adirondack Diversity Initiative. Janeway said he expects this to be an annual funding stream. This funding brings the initiative into what Janeway called its third phase. It started as a group of Adirondack organizations, including the council, which got together, held a conference and determined there was a need for increased diversity in the park. Janeway said the initiative plans to bring tourist groups from New York City and Albany to the Adirondacks next year.